A beautifully stated, provocative, impeccably argued declaration of love and war that counters the pacifist lie that liberationists are “pro-violence” rather than sober realists and vital life forces ……. The ecological foundation of being is unraveling before our very eyes. Without ecosystems there is no life. Fiercely loving Earth is the answer. Let’s sustain global ecology together like our shared survival and abundance depends upon it. And while we set out using classic civil disobedience tactics, let’s not dismiss out of hand any obstruction, uncivil disobedience, sabotage and targeted insurgency tactics – that are non-terrorist – and that may be necessary to achieve global ecological sustainability. The human family’s shared survival depends upon passionately defending Earth using all means necessary. Earth’s ecosystems are collapsing under the burden of human growth, destroying our one shared biosphere that makes life possible. Industrial growth – frantically destroying ecosystems to feed insatiable, ever-growing appetites – is an aberration, a mistake, a disease. If left untreated, this will be the end of the human family, all life, and Earth’s very being. Infinite economic growth at the expense of ecosystems is impossible, and seeking endless and inequitable growth in consumption and population can only lead to collapse and massive die-off. Humanity’s last best chance to justly and equitably sustain a livable planet is to protect and restore ecosystems, end fossil fuels, and a people’s power Earth revolution to utterly destroy the ecocidal industrial growth machine. We are all bloody fools to tolerate and not immediately overthrow a violently ecocidal system that is killing us all. If we all understood the implications of global ecosystem collapse, we would go now, together, and slay the global growth machine. It is too late to escape profound ecological decline, yet complete disastrous social and ecological collapse – and possible end to most or all life – may yet be avoided. Sustaining ecology must become society’s central organizing principle or humans and all species face horrendous death. Globally it is time for radical change to simply survive converging ecology, food, war, water, inequity, population, climate, jobs, ocean, and extinction crises. It is deeply troubling most “environmentalists” deny the severity of ecosystem collapse, rejecting out of hand revolutionary measures sufficient to sustain ecology. Earth is dying a death of a billion lashes as ecosystems are liquidated for consumption as if nature has no worth. 80% of old forests are gone, 50% of top soil, 90% of big ocean fish, bee populations are collapsing, we are undergoing abrupt climate change, and two billion are hungry and thirsty – to say nothing of acidic and dead oceans, nitrogen pollution, fracking and tar sands, extinction, desertification, water scarcity, pervasive toxics, and how all these ecological crises interact and reinforce each other. Yes, you read this right – EARTH IS DYING – not that humans are going extinct, but Earth will recover. A whole body of global change and ecology science and intuition indicates Earth is well past its carrying capacity and planetary boundaries, that enough ecosystems have been lost, diminished, and changed forever, that the biogeochemical process that make life possible are failing. We face an unprecedented planetary ecological emergency. Earth’s ecology crises go unaddressed because of lack of justice, equity and rights –and 1% elite rule with big NGO environmental group greenwash. Earth is dying NOW. The thin layer of life known as the biosphere is collapsing NOW. Life giving ecosystems are being destroyed NOW. Being is ending NOW. It could be different if we acted together to stop the forces of ecocide. The human family embraces a sustaining ecology ethic, or all die brutal, needless deaths, gasping for air, hungry and cold, at each other’s throats. Most of us have lost contact with Earth that made and sustains us, so we kill our creator, life and ourselves without knowing or caring. It is everybody’s responsibility to stop this self-fulfilling death wish. Those who have yet to have this ecological revelation and are killing Earth must be compelled to stop, using all means necessary. There is no escaping the ECOLOGICAL FACT that global ecosystems and our one shared biosphere are literally falling apart as we continue to incautiously pull pieces from them. True peace is not the absence of conflict as enslaved and hurdling towards mass ecocidal death. Peace is rights, equity, justice, jobs, sustainability – for which we sometimes must judiciously fight. 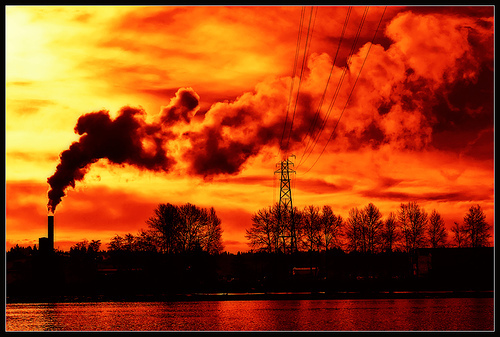 It is ridiculous to suggest that these pernicious trends in ecological destruction – caused by industrial economic growth, which is nearly universally accepted and enriches the powerful 1% elite – will end without a full-scale people’s power revolution – with all available tactics readied for if, and when, needed – by a small but enlightened and dedicated minority. NO one seeks or desires violent revolution, yet Earth is dying, and we need to enter into revolution with all intentions of using civil and disobedient means, but if necessary we may need to cross the Rubicon and embrace uncivil and more confrontational means. Never before has such fundamental social change – challenging the deeply entrenched industrial growth paradigm, and the more is always better growth mentality, eating Earth’s ecosytems – been attempted. A time may well come soon when it is necessary to use all means necessary against real eco-terrorists – those who are destroying with impunity our shared global ecosystems and our one biosphere, which make life possible and are necessary simply to survive. All enlightened planetary life wants and deserves an Earth Revolution that is done wisely, escalates carefully, and is ultimately successful in bringing humanity and Earth’s ecosystems back into equilibrium. We of course want the right resistance, exerted by the right people, at the right time, calling for the right things. And as defenders of Earth and all life’s being – we find all violence repugnant, and do not seek any violence ever. But the stakes are high and we are not leaving any possibilities off the table, except for random terrorist targeting of innocents, which would not be tolerated. Some people are simply taken aback – after several decades of being indoctrinated that civil disobedience is the only legitimate resistance to oppression and imminent death – and are unable to even hear and consider these academic thoughts. Yet, I do not recall ever reading words from Martin Luther King and Mahatma Gandhi saying never, ever, ever will there be another instance where physical confrontation may be necessary or tolerable. Both Gandhi and King provided a great service in making clear non-violent protest is always the preferable option, and that a great deal can be accomplished over time wielding this powerful tool. But they did not foreclose upon ever using traditional revolutionary activities in times of great danger, when it is thought there is not time, exclusively peaceful tactics have not worked, and when life’s very being is imminently threatened. A faith-based movement – as was the basis for both King and Gandhi’s struggles – to bring people power to bear upon global ecology sustainability will not work as the primary motivator of the profound social change necessary to sustain ecology. Organized religion is simply too divisive, and bereft of knowable truth, to address what are fact-based, scientific ecological crises. Organized religion is part and parcel of the history of ecological decline. It is vital to prospects for achieving just and equitable global ecological sustainability that all mythical gods be kept out of government, are made to tread lightly upon Earth, are kept off non-believers’ bodies, and remain within the realm of personal faith. Sustaining ecology must depend upon other more truthful and observable sensibilities such as global land, ecology, family, justice, equity, knowledge, and community ethics. In fact, these two singular men – whose faith based movements brought about important social change – nonetheless have very little to say to inform the necessary dramatic changes needed now to achieve global ecological sustainability. The issues are different, the stakes higher, and the urgency greater. A single charismatic figure appealing to one religious tradition or another is not going to rise to bring Earth to ecological sustainability – our dependence upon destroying ecosystems to meet our desires is too deeply entrenched. Earth Revolution has to come from the people globally. What is needed is a revolutionary Earth sentiment that arises organically from the people. Earth Revolution aiming to equitably and justly sustain global ecology would be well advised to first go through an escalating serious of protest tactics until a well-developed, and sufficient set of demands are met or rebuffed. If the latter, change of the magnitude necessary in a very short time may well come only from an empowered minority practicing leaderless resistance tactics based upon an underground cell structure. People globally would participate in such an Earth insurgency to the degree and using tactics that are consistent with their conscience. It is common sense when you lose the ability to sustain yourself – through despotism, ecocide or injustice – that you have the right, indeed a duty, to defend ourselves. If enough people – perhaps 3% of the human family – all at once rushed and destroyed the sources of ecocidal power – Earth, humanity, and all life could be saved with very little if any violence. Things would be difficult for the formerly rich (broadly defined as those living detached from nature in a comfortable but Earth destroying technological cocoon, including much of the global bourgeoisie) for some time – as they readjust to living within ecological limits. But they would adjust, and all could survive leading simpler, more grounded and meaningful lives, rather than face a final and brutally violent apocalyptic end under the status quo. To refuse to even consider more robust revolutionary tactics – which for many have brought freedom, and ended monarchy, slavery and other ills – to protect all life’s shared survival from global ecocide in the short time we have, is copping out on Earth and virtually assuring an end to being. The timing for Earth Revolution is so right: Earth is dying, people are suffering, species are going, freedom is failing, uber-inequity reigns, economic injustice is the norm, yet people are awakening. There has never been such high hope regarding the prospects of achieving global human and economic rights, equity and justice, and of the need to sustain ecology. And given the terrible state of global ecology, equity, justice, freedom, and rights – governments have in fact abdicated. Only profound, revolutionary, gut-wrenching social, economic, political and personal change will save Earth, humanity and all life from ecology collapse and an end to being. Failure to accept revolutionary change tactics means we are accepting ecosystems and society will collapse, and you just want to enjoy living excessively awhile longer. Surely it is not rational to fail to pursue revolution because it may become violent, when violence orders of magnitude greater exists now daily under the status quo growth machine, and will only intensify as apocalyptic end of the world approaches. We should pursue Earth Revolution using aggressive civil disobedience and non-violently as long as we can and they are effective. But the successes achieved have thus far been tiny compared to what is required to abet ecocidal trends. If accommodation and compromise continue to be rebuffed, and Earth is dying, and thus our very survival depends upon ecosystems which are being killed by ecocidal evil, we have an obligation to look at other well-known uncivil disobedience, non-cooperation, sabotage, and insurgency tactics – as well as emerging transnational protest opportunities presented by the Internet – to bring about social change for a living Earth. Given the political and economic systems’ inherent and profound violence to people and nature – as well as urgent global justice, equity and ecological imperatives – strategies and tactics are going to have to continue to be evaluated and evolve. Violent or non-violent is not the main consideration, and rarely are they exclusive. Other aspects of radical social change tactics – such as effective or non-effective, civil or uncivil, timely or too late, accommodating or not – are just as important. Leaderless resistance tactics used by current global revolutionary movements could morph into underground cells waging revolution for global freedom, rights and ecosystems. The necessary Earth Revolution to sustain global ecology could escalate to non-cooperation with the ecocidal system, agro-ecological gardening while obstructing industrial agriculture, protecting and restoring ecosystems, and love-making and sharing. And maybe – and only if absolutely necessary – Earth Revolution could embrace wisely conceived and targeted sabotage and insurgency to utterly destroy the global growth machine that is devouring ecosystems and destroying being. There are many soft targets in the under-belly of the industrial growth machine that is liquidating ecosystems for throw-away consumption. Poorly defended fossil fuel, old forest logging, communication, pipeline and other industrial infrastructure abound. We know the primary perpetrators of ecocide profiting from Earth destroying activities, and they could be made to pay a heavy price, dissuading others from doing so. Throughout history there are instances where revolutionary violence has been a liberating force, and other times where it has been oppressive. The coming Earth Revolution need not be overly violent. Like most revolutions, there will almost certainly be some. Again, NOBODY SEEKS VIOLENCE, and revolutions which don’t emphasize violence, while acknowledging the rights of others to act within their conscience, and which do not try to use violence to control its members, can often be remarkably free of physical coercion. Other times, where vital social change cannot be delayed – yet is highly contested by privileged elite – this may not be possible. Ongoing institutionalized violence by the elitist economic growth machine, military legions, resurgent fascism and corporate ecocide far exceed what has occurred historically during liberating people power revolutions (and much of this is often incidental and caused by fringe forces). The level of violence during any possible Earth Revolution would largely be determined by the responses of the oppressors to legitimate and enlightened opposition to end ecosystem destruction, injustice and inequity. As I have spent a lifetime studying global trends of ecological decline, it has become clear that current remedial actions are going to be orders-of-magnitude inadequate. The over-population, ecosystem loss, toxics, injustice and inequity are just too pernicious. And I have also long had a fascination with the topic of non-violence, and when violence may be justified and necessary. These life-long observations have led me to become a reluctant member of the revolutionary left. I am well aware of what humans are capable of in terms of violence, and the damage it does. I grew up in a family rife with childhood sexual abuse – in which I was violently sexually abused by a “favorite” uncle. My own topsy-turfy relationship with my lovely wife – who I love so much we have been married twice – was nonetheless marred by emotional and physical abuse on both our parts. Paradoxically, I excelled as a private in the army, yet left seeking conscientious objector status. After leaving the army, I was quite proud of my commitment to peace, as I am now. And some former acquaintances are undoubtedly put off by the cognitive dissonance of a peace activist embracing revolution. But now, unlike then, I can envision something for which I would be willing to fight – other than god or country, which I have long rejected as the basis for killing – and that is continued existence for all life. We are one human family utterly dependent upon Earth’s ecology for shared being. And if we don’t fight the forces of ecocide win and everything dies. Knowing this, I have followed big dreams with my life, with no guarantees, and very few fundamental regrets. Giving your life to Earth is deeply satisfying. Nonetheless, sometimes I feel so traumatized by what I know is being done to Earth, and what will be the consequences, that I can hardly carry on. I am comforted by the expectation that at some point – those that realize Earth is dying – will have to take matters into their own hands, and will succeed. Indeed, people are coming together now for ecology, workers and rights. Such a people power Earth uprising is the only way we survive together. 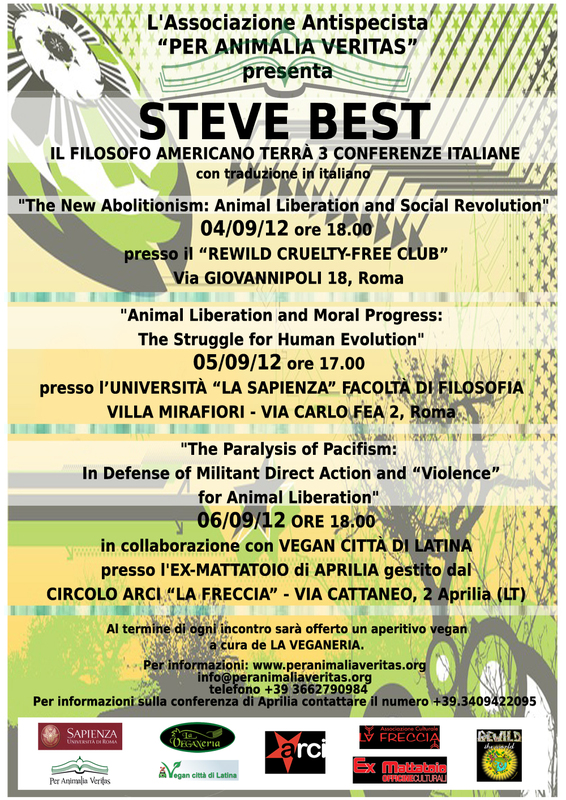 This lecture was given at a former-slaughterhouse of Aprilia, Italy (now a cultural center) on September 6th, 2012. This talk was videotaped by the Veggie Channel and uploaded to their videopage and to You Tube. 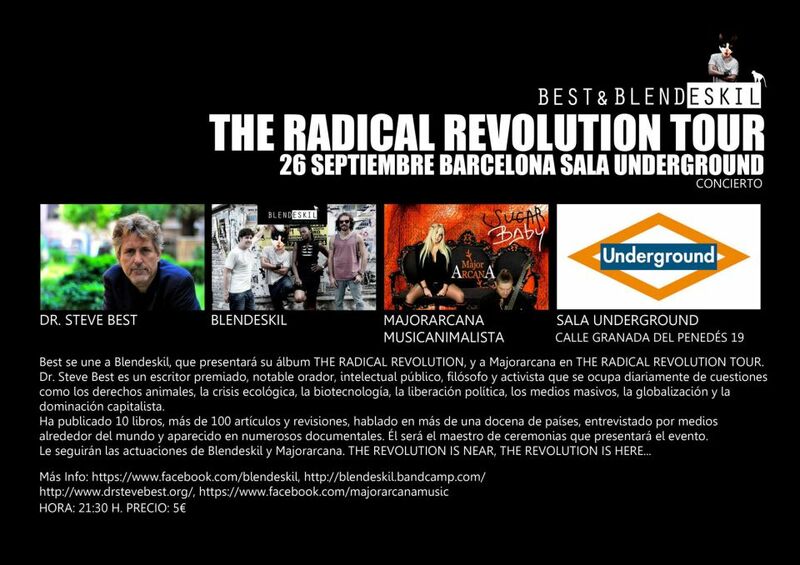 This talk given at the Sala Underground, Barcelona, Spain, September 26, 2012. It was a blast to perform with animal liberation bands, Major Arcana and Blendeskil!